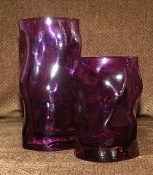 Vintage From Paul is pleased to offer these Bormioli Rocco Sorgente Deep Purple Double Old Fashion Glasses. Sorgente Glasses in Purple have an earthy, natural yet unique shape that fits comfortably in your hand. These stylish glasses are a versatile accessory that brings a special touch to any kitchen. Charming and fDouble Old Fashion Glassesun, your guests will fawn over this gorgeous glassware. The Bormioli Rocco Sorgente Deep Purple Cooler Glasses stands 4-1/4 inches in height and they have a 10-1/2 fluid ounce capacity.